Armeg Masonry Fixings Installation Set - features a combination of drill bits and screwdriver bits from the Armeg Twister range of Impact Rated Accessories. These bits are specifically designed for the optimum performance in impact drivers. This 15 piece set comes complete in a handy fabric roll with contents and sizes printed for easy tool identification. High quality, high alloy steel. Manufactured using a 1-piece body construction. The drill bits provide the durability and strength required to withstand the torsional impact of an impact driver. Custom-ground drill tip. Reduces the torque placed on the drill bit for faster and more efficient drilling in impact drivers. ¼" Quick-change shank. Tools can be rapidly interchanged in the same power tool for the ultimate convenience. Optimum manufacturing process. Manufactured from high quality S2 steel, combined with the optimum heat treatment process to provide the ideal balance between strength and flex. Torsion Portion Design. 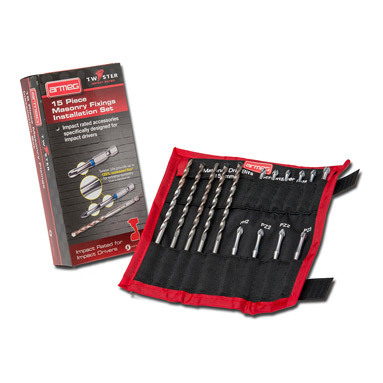 All Twister screwdriver bits feature a Torsion Portion Design, which is a section of the bits designed to only 3.75mm thick. This allows for up to 133% increased flex over a standard bit and absorbs torque peaks to reduce stress at the bit tip and provide extreme durability in impact drivers. Multiple length options. The Twister range of screwdriver bits are available in both a 50mm and 75mm length version which provides versatility for work on different applications and in particular 'difficult to reach' jobs.